Every day, more than one billion people around the world rely on the Superior Accuracy™ of AccuWeather to help them plan their lives, protect their businesses, and get more from their day. 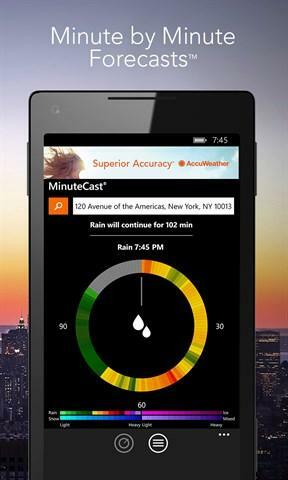 AccuWeather – Weather for Life designed for Windows Phone users has the very latest in weather news and information, including MinuteCast®, the leading minute-by-minute weather forecast that is hyper-localized to your exact street address. Our forecasts are also easily seen from your Windows Phone 8 lock screen! Key features include: •	MinuteCast® – minute by minute precipitation forecasts for the next two hours hyper-localized to your exact street address. Includes precipitation type and intensity, and start and end times for precipitation. Available for the Continental United States, Canada, United Kingdom, Ireland, and Japan. •	Severe weather notices for all locations – visible from anywhere within the app. Pushed severe weather alerts straight to your Windows Phone for locations in the United States, Canada, United Kingdom, and Germany. •	Accurate, local forecasts for nearly 3 million global locations in 27 languages. Forecasts include current conditions, hourly forecasts for the next 72 hours, and extended forecasts for the next 15 days. •	Current weather conditions displayed with location name and time, temperature, wind speed, wind gust speed and wind direction, precipitation and amounts, humidity, visibility, UV Index, cloud cover, pressure, and AM and PM times for sunrise and sunset. Option to set current conditions to update as your GPS location changes. •	The Local Forecast Summary, a brief summary of what you can expect from the weather over the next 3-5 days for your location. •	Fully interactive, full-screen Bing Maps overlaid with AccuWeather’s precise weather data, including U.S., Canadian, European, and Japanese radar. •	Unlimited location storage for your GPS location and all your favorites. Nickname your locations and easily swipe between them using the panoramic view and by saving them to your Start screen. •	Windows Phone 8 users: Lock screen populated with a beautiful weather photo illustrating the location’s current conditions. 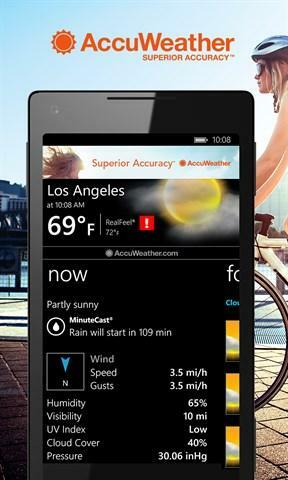 •	Windows Phone 8 users: Three-Size, customizable Live Tiles for multiple locations that peek and automatically update the forecasts on the Start screen. Download AccuWeather – Weather for Life today for free and experience the Superior Accuracy™ that comes from high-quality weather forecasting.